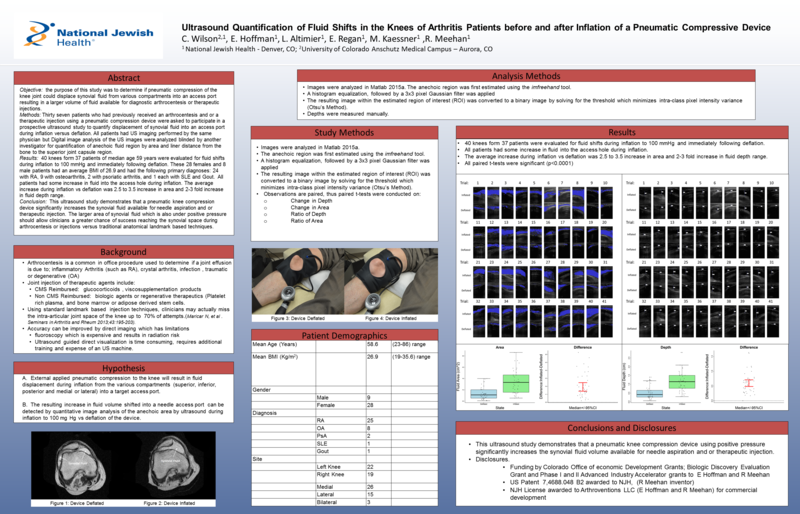 Clinical research poster from an IRB Approved study performed at National Jewish Health (NJH) and presented at the 2015 American College of Rheumatology (ACR) Annual Meeting. The study documents the amount of fluid shifted using our device and demonstrated a 2.5 to 3.5 increase in the target area of synovial fluid available for aspiration or injection. This research was funded through 3 grants from the State of Colorado: Bioscience Discovery Evaluation Grant (BDEG) and Advanced Industry (AI) Accelerator Phase I and II Grants.